The Problem: your computer is getting slower, there is not enough disk space, you get system issues and have no idea why. It's just too difficult to find the right settings to fix everything. The Solution: FileCleaner automatically fixes PC issues, deletes system junk and protects your privacy. It intelligently repairs system settings, helps you uninstall rogue software, and does a complete PC cleanup for ultimate speed and performance. The Result: a fast, stable and secure computer that's kept in top shape in real time. Otherwise your copy of FileCleaner will stop working. 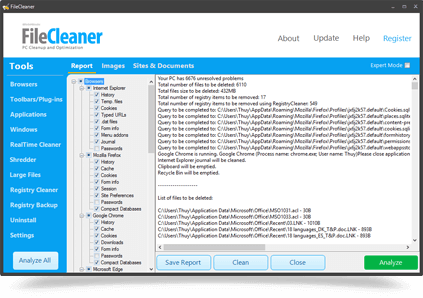 FileCleaner includes an easy to use, yet powerful Windows cleaner. Use it to find issues and conflicts, eliminate system crashes, and fix corrupted settings. Doing this on a regular basis will dramatically increase Windows performance and stability. Do you have annoying toolbars that are slowing down your browser? FileCleaner has a tool that will remove any toolbar in one click. You won't have to look for complicated toolbar uninstall tutorials ever again because FileCleaner can quickly uninstall any toolbar or add-on. It's not a secret that some programs can be very hard to uninstall. With FileCleaner's Uninstall feature you can uninstall any program in a matter of minutes. If the program cooperates, FileCleaner will use its native uninstaller. But if it's stubborn, FileCleaner will simply remove all its records from your PC. When you delete a file, it’s not really gone and can be restored with the help of file recovery software. 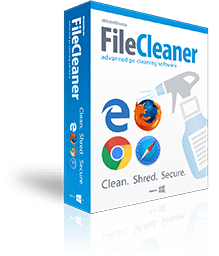 Files deleted with FileCleaner's built-in file shredder are erased in such a way that no software can recover them. When you shred files with FileCleaner, they are gone for good. FileCleaner goes one step further than other PC cleaners by helping you manage your files. Use the Large Files tool to find the largest files on your drive and quickly move or delete them to save space. You can preview all files including videos, images, songs, and more before you move or delete them. FileCleaner is completely safe to use because only "green" options are checked by default. In addition to that, it creates a backup of the Windows registry in case something goes wrong. We guarantee that it contains no spyware or adware. FileCleaner comes with a fully-functional 14-day free trial period. During this time, you'll be able to use all the features of the program and see how effective it is at keeping your Windows PC fast, stable, and secure.